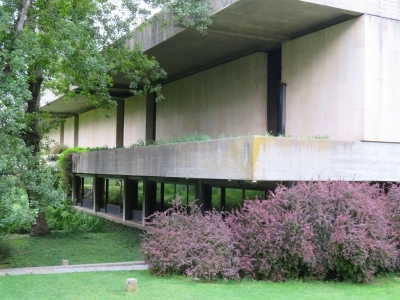 Head Office and Garden of the Calouste Gulbenkian Foundation is part of the Tentative list of Portugal in order to qualify for inclusion in the World Heritage List. 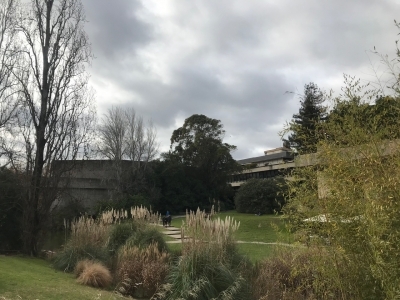 The Head Office and Garden of the Calouste Gulbenkian Foundation are easily visitable from the nearby metro station: São Sebastião. Arriving mid-evening, numerous locals were enjoying this green space with blanket spreads, picnics, or just people lying down on the beautiful grounds. The garden is pleasant indeed, with bamboo, a trickling brook that dissects the grounds (plenty of turtles, ducks), and modern statues surrounded by green foliage. This was a highlight for me since we had spent several hours exploring Lisbon (2 days) during the morning, evening, and night (often quite busy). Therefore, this little slice of green mixed with modern architecture was a breath of fresh air. Certainly, the use of concrete and glass here stands out. In some ways, the greenery has enveloped the large modernist structures, creating a unique interaction of the man-made and natural components. To me as a musician Gulbenkian meant until recently a Portuguese Orchestra. For most visitors of Lisbon probably means one of the best museums in the capital. Behind both of them stands the same Gulbenkian Foundation and I think one needs to know a little bit about it to understand this application on the tentativ list. The museum was built in the end of the 1950s, “when the country was still dominated by a conservative dictatorship, closed to the world and resistant to the values of progress. The foundation thus emerged unexpectedly in Portugal as a symbol of and place to promote art, education and science”. From a national perspective importance of this foundation can hardly be overrated. But what is there to see? There is a big modern park with several buildings in it. Out of them only the big head office seems to be included in the application. This is a brownish long stretched building consisting of several simple volumes, quite Corbusier-like. The park around it is inspired by certain Japanese garden ideas: Big stone plates form the paths through lawns, ponds, artificial waterfalls, bamboo groves and old trees. Those trees are the most interesting aspect of the park: They stand in contrast to the modernity of the buildings and the garden. It seems the garden is based on a recreational farm from the 13 century. Therefore some of the trees may be very old and sometimes one gets the impression the buildings were created in respect to the trees and not the other way around. The building itself seems neither very beautiful nor special to justify an inscription on the merits of its architecture. Nor are the architects great names that have been waiting on a place on the list when some greater colleagues are still waiting for theirs. The main argument for inscription had to be based on the importance of the foundation and it seems consequent that in the application text of the state party the expression “intangible importance” pops up many times. If this is of national or international importance and if the world heritage status is the right way to honour this outstanding foundation remains to be disputed. A visit to the museum is recommendable in any case.